Cut Off, tackle tough cutting jobs with the newest addition to the iON tool series the Sun Joe iON16CS 40V 16-inch cordless chain saw is the Core Tool for you. This cordless dynamo is also engineered with a powerful 600W brushless motor for increased battery efficiency, optimal motor performance and extended motor life to keep your iON chain saw sawing strong season after season. Ideal for cutting thick limbs, firewood, logs and branches, the iON chain saw starts instantly with a simple push of a button and its lightweight, ergonomic design (only 12.8 lbs.) maximizes user comfort during use. Featuring a self-lubricating 16-inch Oregon cutting bar and chain, the iON chain saw can easily saw through the most stubborn tree limbs, up to 14.6-inch thick. And, its tool-less chain adjustment system makes operation virtually maintenance free, Safety features include a hand guard with kickback brake, a protective sheath for safe blade storage, and a built-in safety switch to prevent accidental starting. 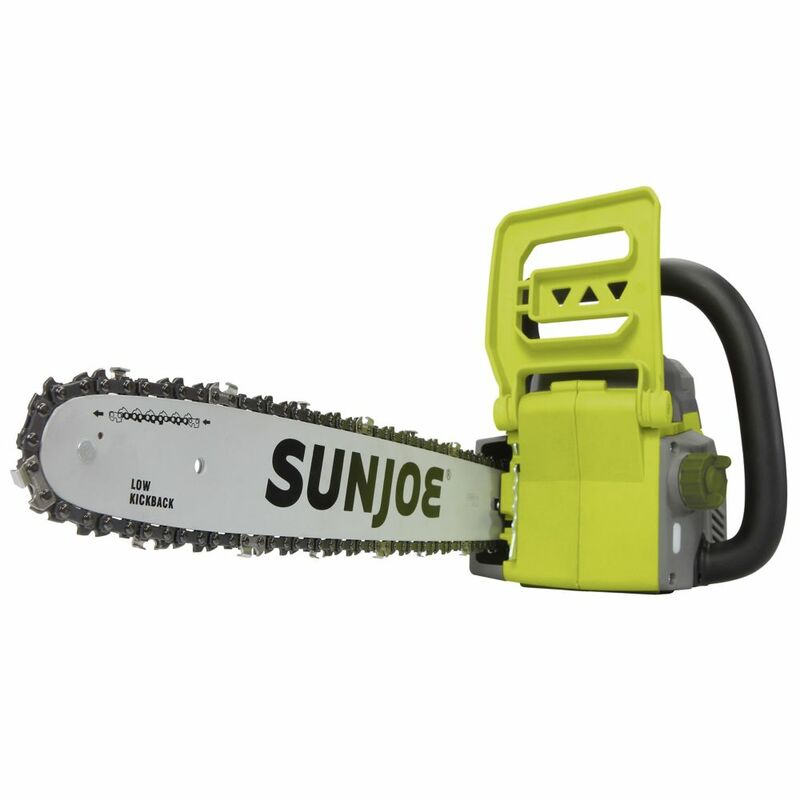 Backed by a full 2-year warranty and marked with the ETL, the Sun Joe iON16CS 40V 16-inch cordless chain saw makes it easy to Get Equipped for a variety of outdoor cutting chores. Battery and Charger Not Included. The Black+Decker LCS1020 10-inch Chainsaw includes a 20V Max Li-Ion battery for long run time and prolonged life. A 10-inch premium Oregon low-kickback bar and chain facilitate smooth and fast cuts. This combo kit includes a 20V charger and a 2-year limited warranty for added peace of mind. iON 16-inch 40V Cordless Chainsaw with Brushless Motor (Tool Only) Cut Off, tackle tough cutting jobs with the newest addition to the iON tool series the Sun Joe iON16CS 40V 16-inch cordless chain saw is the Core Tool for you. This cordless dynamo is also engineered with a powerful 600W brushless motor for increased battery efficiency, optimal motor performance and extended motor life to keep your iON chain saw sawing strong season after season. Ideal for cutting thick limbs, firewood, logs and branches, the iON chain saw starts instantly with a simple push of a button and its lightweight, ergonomic design (only 12.8 lbs.) maximizes user comfort during use. Featuring a self-lubricating 16-inch Oregon cutting bar and chain, the iON chain saw can easily saw through the most stubborn tree limbs, up to 14.6-inch thick. And, its tool-less chain adjustment system makes operation virtually maintenance free, Safety features include a hand guard with kickback brake, a protective sheath for safe blade storage, and a built-in safety switch to prevent accidental starting. Backed by a full 2-year warranty and marked with the ETL, the Sun Joe iON16CS 40V 16-inch cordless chain saw makes it easy to Get Equipped for a variety of outdoor cutting chores. Battery and Charger Not Included. iON 16-inch 40V Cordless Chainsaw with Brushless Motor (Tool Only) is rated 4.7 out of 5 by 17. Rated 5 out of 5 by DanvilleCruiser from Easy to use lightweight chain saw I was an absolute novice as I had never used a chain saw before and was frankly a little afraid of them. I was able to assemble the chain saw with only a little difficulty getting the chain correctly in place. The directions in the owner’s manual were not as clear as I would have liked regarding getting the chain in place, but I found a helpful video online. Once assembled, I added chain and sprocket oil and ventured off to cut up a tree that had fallen during a recent storm. Even with the battery in place, the chain saw was not too heavy and was easy to maneuver. The battery life has been terrific thus far. I appreciated some of the helpful tips as to how to cut up trees since I am a novice. I would not hesitate to recommend this item. Rated 5 out of 5 by Buried in MN from Very useful for my tree removal project I am removing a lot of small to medium (up to 6 inches diameter) from my property and amazed how rapidly this saw cuts. Cut down a 4 in tree and sectioned it into 2 foot lengths (4 cuts) in about 90 seconds. I have not been able to run the battery down past 2/3 charged since it doesn't take long to cut and then I shut it off. Neighbors (and me too) at how quiet this saw is. Rated 5 out of 5 by R from Fl from this is a great tool I notice people having problems with chain coming off. After installing chain put oil in reservoir and run saw for about 15 seconds. Check tension. All new chains will expand quickly. Tighten if necessary and run for about 30 to 40 seconds and check again.tighten if necessary and repeat this a couple more times. After this check after about five cuts. After this you should be good to go. Always check tension periodically as you are working. I hope this is helpful. Rated 5 out of 5 by Huey from excellent tool for the price this tool is a workhorse. It's very well constructed and has lots of power.It's amazing how much work you can get done on one charge. I highly recommend this saw. Rated 4 out of 5 by sun11 from i like the saw. its well balanced. the only thing I don't like is its advertised as a 16 inc bar ... i like the saw. its well balanced. the only thing I don't like is its advertised as a 16 inc bar and mine measured from the spike to the end 14 1|2. Rated 5 out of 5 by Whenessy from Powerful, amazing machine, Easy to maneuver, very sturdy, clean finish poweful. Rated 5 out of 5 by Jay and Candy from Love it! I’m really happy with this product. I’ve used it and it works great! I highly recommend the chainsaw. I also recommend this company’s other products. I have purchased 5 other items and I am very pleased with them all.